Do you have a gap in your smile that is getting you down? Tooth loss is a common problem and will affect most of us during our adult years. In fact, by the time we become middle-aged, many of us will have lost up to a dozen permanent teeth. The functional impact of tooth loss can be difficult to bear. Depending on where the gap is, you may struggle to eat properly, or even form some sound when speaking. The psychological effect can be profound too, with many patients suffering from lost confidence and low self-esteem that causes a ripple of self-doubt throughout various aspects of their life. Dental implants are considered by most dentists to be the most effective and superior solution for replacing teeth that have been lost or extracted as a result of extreme decay, damage, or trauma. This is because dental implants do not only replace the visible portion of the tooth. Instead, the entire device is anchored into the jaw bone, with a titanium post taking the place of the original tooth root. Over the course of the months following implantation, the bone then regrows around the post, securing it permanently and steadily in place. The artificial tooth is then attached to the implanted post, completing the solution. Dental implant surgery itself is fairly quick and minimally invasive. That said, the total process, including the recovery period, can take a number of months. 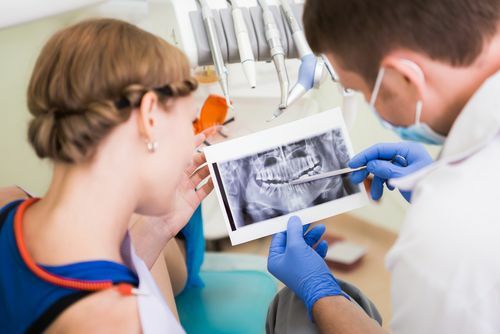 This is because your dental implant provider will need to be sure that the bone has successfully fused around the titanium post before the permanent, artificial tooth can be attached. This fusion is called osseointegration and can take a number of months. Exactly how long depends on the individual patient’s rate of healing. If you are found to have insufficient healthy jaw bone to support a dental implant, you may still be able to benefit from the solution but will first require a gum graft. If this is the case, it could take anywhere up to 9 months for the graft to integrate with the original jaw bone. This must happen before the implant post can even be placed. Since the dental implant process takes place over a number of appointments, you will undergo several different recovery periods. Knowing what to do and how to support your healing can reduce your risk of experiencing complications and ensure you get the best possible outcome from your solution. Here are our key tips for recovering from dental implant surgery. Your dental implant provider is committed to making sure that your implants are successful and that you have the best experience possible while in their care. With years of training and experience under their belt, your implant provider knows best what you should and shouldn’t do after implant surgery. They will issue you with a strict set of guidelines to follow that will help expedite your recovery and reduce the likelihood of complications. Your mouth is likely to be sore and swollen after your implant surgery, and so your provider will probably recommend that you follow a diet of only liquids and soft food, at least for the first week or two of your recovery. Opt for mashed potato, steamed vegetables, pasta, soup, smoothies, yoghurts and similar foods as these will put the least amount of pressure on your gums. Remember that your mouth may be sensitive to extreme temperatures, so ensure that items are moderately hot or cold, but not to the extent that they might trigger pain. After a few weeks, you will probably be able to start introducing firmer foods, but if you are in any doubt, speak to your dental implant provider. While implants are known for being one of the most long-lasting of all dental solutions, you do need to take adequate care of them to ensure that they remain functional looking good for as long as possible. This means brushing properly at least twice a day, flossing carefully and using a fluoride mouthwash. There are also certain dental habits that you will need to break if you are going to sustain your implants, including clenching/grinding your teeth and using your teeth as tools, such as to open cans of drink. If you clench or grind your teeth, your dentist should be able to provide you with a mouth guard which will protect your natural teeth and implants from friction damage caused by this habit. If you would like more information about dental implants including the recovery process, our knowledgeable team are on hand to help. Please contact our office today at 727-312-1300 to learn more.